patrañas, L. pastoranĕa, Eng. acceptance of lies or fabulous legends especially intertwined with references to the salvation or the reincarnation and the resurrection of Christ. Juan Ruíz uses the word with a double meaning to explain the custom in autumn during pig slaughtering time, at the end of the day the old women sat beside chestnuts roasting on the fire saying their prayers, accepting Christ’s salvation, spinning yarns about the past or simply gossiping. In the eerie shadows of the evening before the fire, their murmurs come to sound like bewitched, morbid notes as the voices Macbeth’s witches. 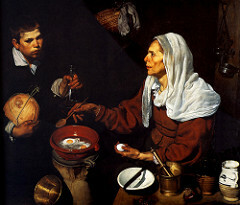 Diego Velazquez painted her cooking eggs, which represent the resurrection of Christ as eggs were served when celebrating Easter but prohibited during Lent. Indeed the old woman has a place in all periods of Spanish history. Soak fava beans in water with soda overnight. Rinse well and put in pot. Cover with water, bring to a boil, low heat and simmer 15-20 minutes until the beans a tender. Chop onion. Heat olive oil in a frying pan. Add onion and fry until translucent. Remove the onion. Slice chorizo and add. Fry a little. 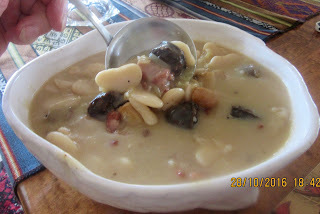 Drain fava beans, saving the broth in a pot. Cook broth. Add wine. Let thicken. Add beans. Let cook until thick.